Five years or so ago, marketers were panicky. Their world was changing everywhere – no one trusted their advertising anymore – you saw the numbers -72 percent to 94 percent, depending, didn’t (and don’t) trust the ads that they saw from brands. Trust was shifting to the customers’ peers whose reviews were seen as far more reliable than the stuff being churned out by the marketers themselves. Not only didn’t that, but the methods that used to work, seemed to not work anymore. One of the other reasons was the proliferation of messages via the many channels that we intersect day in and day out. If the numbers out there are to be believed, each of us is hit directly or indirectly with 3,000 messages a day — including everything from a direct mail piece to a TV ad to a banner ad on a website to email marketing ads. That amounts to a lot of noise and little identifiable or obvious signal. Marketing, which historically had relied on pushing those messages out to us via campaigns of one sort or another, didn’t have the methodology or approach to understand what customers were looking for, so the messages remained loud static. Customers were interested in messages that resonated with each of them individually. One person’s noise is another’s signal. Marketers went into a panic as the trust in their content plunged and the trust in brands sunk. But with the advent of social listening, increasingly powerful and more effective analytic tools, the proliferation of social data, and the awareness that customers were (are) looking for highly personalized content, things began to change. Marketers moved from seeing their role as the pushers of brand content at customers – doing the equivalent of throwing something at the wall and hoping it sticks – to the planners and executors of marketing as the first line of engagement with customers. No longer were they competing with just competitors’ messages; they were now competing to get the attention of customers. The competition was the other 2,999 messages daily that bombarded their prospects. The customers — to say, “ahhh, THAT one will be the one I want to read and act on” — needed personalized content. Another trend became noticeable, too. Marketing, for the first time, was being made accountable for revenue and was aligning with sales to do that – a trend that made for more cohesive and more powerful businesses. No one suggested merging the two departments, but there was a natural progression from marketing to sales and coordination of the two. Outcomes that led to increasing revenue for the company was something that as far back as 2008 became noticeable in Peppers and Rogers “New Power Couple” paper. The companies that won the Watchlist this year are those who understood the market changes and, in their own way, each acted accordingly. Their win is well deserved because they get it and they acted on it. So let’s take a look at our winners – Adobe, Callidus Cloud and OutMarket – three very different companies and yet, each has had an impact in its own way and will continue to do so. Most everyone I know hates ads. But at the same time, most everyone I know has ads that they love because they are funny (Richard Sherman, Eric Stonestreet Adobe Marketing Cloud) or adorable (Budweiser puppy Superbowl ads 2014 or 2015) or just plain memorable (Banco Sabadell) in some way – an artistic one usually. 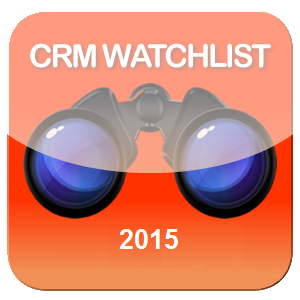 And that goes to the heart of why Adobe is a CRM Watchlist 2015 winner. They have a marketing cloud as do their competitors like Salesforce and Oracle, but they also have the unique ability to integrate the Creative Cloud with their Marketing Cloud via the integration of the Adobe Digital Publishing Suite and the Adobe Experience Manager. Thus, Adobe can deliver optimized content across multiple platforms and channels with easy to navigate usability. Okay, that’s all kind of blah-blah terminology — but all true about what Adobe can deliver. They also have powerful analytic and testing tools that are clearly both battle ready and scalable. American Express, who I met with at the Adobe Digital Marketing Summit in 2014, told me a story of how they set up their many consumer card web pages and use the Adobe Target A/B testing to do it, in real time and at a rather mind-boggling scale. Without going into the numbers, let’s just say: It was a really impressive number. Honestly, having a superior product doesn’t get you on the Watchlist as a winner at all; you need a superior company. I don’t mean a company that wins a lot of awards, though Adobe does do that. (They’ve been the leaders in Gartner’s Magic Quadrant for Digital Marketing Hubs, a leader in Forrester’s Enterprise Marketing Suites Wave and several others.) I mean a company that has the financial stability, the ecosystem, the leadership, the well-rounded culture to sustain their ongoing relationships with their customers and at the same time, has the thought leadership and outreach to make their bones in the market continuously over years. Their vision, while not really all that visionary, is still a generally clear expression of both market forces and enablement – “At the heart of Adobe’s vision are two essential elements: data and content. At Adobe, we believe digital experience and engagement are morphing into more than just the Web experience – its morphing in-app, in-car and beyond in the Internet of Everything. We’re focused on enabling marketers to deliver great content and bridge online and offline channels along the customer journey.” Too much tech and product here (a consistent issue with them) but nonetheless, it makes apparent that despite some shortcomings, Adobe has a clear picture of the market and business climate and where it’s moving. Their vision is inculcated into what they do and — if you take a look at their rather terrific partner ecosystem — you see how they are thinking. They understand that they don’t have the entirety of what is necessary to satisfy contemporary enterprises. So they have built out a serious set of integrations via technology and strategic partners with the companies you would expect they should, including Salesforce, Microsoft, Oracle and SAP. But because of their heritage, they don’t stop at the technology companies. For example, they have a powerful strategic relationship with Publicis. Aside from the go-to-market components of the relationship, Publicis is standardizing their marketing management platform (with agency nuances) on the Adobe Marketing Cloud. That is something that at the moment Adobe can do uniquely well – integrate with the agencies. I’m not saying that others can’t do that – e.g. Infor’s marketing tools can – but Adobe just simply does that the best of anyone. The Neolane integration continues but is well along so that the basic traditional marketing functionality that is still necessary for businesses to run their marketing departments is, for the most part, there. This makes them a major player in the industry with a true shot at being the leading Marketing Cloud due to their unique possibilities. But to get there, there are some things they have to do. Of course there are. 1. Fix their messaging…big time – For a company that actually aligns so well with contemporary marketing needs – at least technologically – their messaging needs a lot of work. It is a highly product-centric message in an era that requires focus on engagement and outcomes. For example, their overview reads, “The Adobe Marketing Cloud is a comprehensive best in class solution built on a data platform with a common set of core services…” I won’t finish the rest. It continues along the same path. You get it. This is not either outcomes-based or focused on the needs of the customer, but is instead completely product-centric. The irony is that when it comes to creative video, they are unmatched, as the Richard Sherman ad mentioned above or this ad proves. In a sense they should take a lesson from their Creative Cloud side and focus on outcomes, not product. 2. Expand the portfolio – Don’t get me wrong. Adobe, through the integration of Creative Cloud and the Digital Marketing Cloud (see above) has a unique value proposition that gives them a leg up, not just generally, but an overwhelming one with agencies. But the competition is incredibly hot in this market and to really fill out their ecosystem, they need to either build or partner for customer journey management capabilities. For pure digital marketing and the analytics behind it, no one is going to trump Adobe, but right now Salesforce and Microsoft both have, respectively, native or partnered journey building and tracking that Adobe only has in bits and pieces. Additionally, Adobe falls short on loyalty marketing, something that many of their competitors are very good at, and a necessary component of engagement. 3. Grow their industry outreach – There is no doubt that Adobe, with some glitches is making an effort at breaking out of the more traditional public relations/analyst relations model. But they still have a LONG way to go and they need to go there fast. At this point, an influencer relations program that combines analysts, with influential journalists, and adds peer influencers of note wherever they reside, would be a welcome addition or even substitution for Adobe. In practical terms, that means that Adobe needs to expand its independents program. For example, without mentioning names, they need to not treat independent analysts as journalists and bloggers, even though the analysts might have a blog. They have to expand their reach to considerably more independents and boutique firms than they have. They need to start reaching out to influencers who aren’t obvious – similar to what OutMarket does (see below). Aside from the expansion of their independent outreach, they need to be showing up at more industry events and participating in the industry. Their current participation e.g. ad tech or CES is a mix of events that Creative Cloud devotees would attend and a few marketing based – DMA and DemandCon. Expanding to more CRM and engagement focused events such as CRM Evolution or Gartner 360 or Customer Engagement World would be in their best interests. There is no question that Adobe has a shot at leading the marketing, um, market. They have the reputation, the intelligence, the product portfolio and the desire to do just that. When they acquired Neolane in 2013, they filled their biggest hole. Now they just have to tweak a little (no not twerk, tweak) and stay their course and their impact will just keep increasing. I know that. Callidus Cloud could actually have been included in sales, and if you know their pedigree – sales compensation – you probably would have put them there. Instead, I’ve put them in marketing this year. One reason is convenience. I have no others I would group in and around sales. But, more importantly, with their refocus around what they call “Lead to Money“, they are pretty much a company that has shifted its emphasis to marketing – or, more importantly, the alignment of sales and marketing. And that makes them smart. This expansion gives them most of the steps along the process that they are going to market with – Lead to Money – one of the few companies that has a portfolio in the present that actually supports their key go to market message. Most companies underestimate the size and scope of Callidus Cloud. This is a company with 3,500 customers, many are marquee level, a substantial revenue stream – more than you would expect – and some serious reach in vertical markets. They have a solid, dependable management, who make careful decisions (lower risk) but for the most part are uniformly effective. They take their time and integrate the new platforms and applications they’ve acquired and to work out how they are going to interact with each other, leaving few loose ends along the continuum of their “lead to money” process map. For example, the Clicktools acquisition seemed the most, well, out there – the one that you would think leads to head scratching. Where along the lead to money continuum does it fit? Lead? Money? Something else? The answer is everywhere. Imagine having the ability to provide and receive real time feedback at every point in the process. Process improvement becomes a no-brainer, customer expectations and desires become known quickly, potential churn or risk with customers can be identified almost immediately. I could go on, but all in all I suspect you see what I see. These are smart acquisitions that have a purpose and are part of a thinking along a continuum. They have made a substantial investment over the last year or more in outreach and thought leadership and are showing their commitment to making an even more substantial effort in 2015. One of the highlights of the year was the hiring of Chris Bucholtz, a CRM industry veteran and thought leader in his own right. He is one of the ones that are respected and loved by the analysts, influencers, journalists etc. and has functioned as each of those at one time or another. He has the ear of a lot of the most influential people in CRM and thus gives Callidus Cloud a capability they haven’t had before. Callidus Cloud does a good job with thought leadership content – more than most. I was doing some research on the alignment of sales and marketing and by accident, not design, came at least a dozen pieces of excellent content related to sales and marketing alignment. Unlike much of the content that passes as thought leadership, these documents didn’t push Callidus Cloud products; they were solid conceptual pieces that showed a true subject matter expertise – not an easy thing to do. Clicking on each of the links within each of the tabs gets you to a site optimized for the role, or industry or challenge/outcome. The value of this approach is that it addresses the real world of customers and buyers which is they are looking for solutions to enable their company and to support the outcomes they are striving for themselves. Twenty-first century sales require that you know what the buyer is looking for as an individual as well as a representative of the company. Their website is designed to address a real world approach – a rarity. So, you have this company, solid management, good revenue, smart content, well focused marketing and improved outreach. What can they do better? 1. Growth of partnerships – Don’t get me wrong. They have a pretty good set of alliances. They’ve landed some of the largest consulting firms – e.g. PwC, Deloitte, Accenture, Cognizant, Tata Consulting Services – some of the industry giants. They integrate with Salesforce, Microsoft, SAP, Oracle and NetSuite among others – I suspect primarily via their legacy focus – incentive compensation management. They’ve got what they call, a little strangely, integration partners that are different than the aforementioned, such as Open Symmetry and Spectrum who provide secondary optimization and enablement capabilities – enriching the overall suite. This is a solid program. But they need to think differently. Right now they need to start thinking ecosystems. For example, their acquisition of Clicktools indicated ecosystem. Why? Because it was a missing piece that fit into a portion of their technology matrix that would substantially improve what they could offer potential customers. If they are thinking old school here, that acquisition makes no real sense. Ecosystems, it makes complete sense. I would recommend that they do an “ecosystem exercise.” That means that you sit down, figure out what customers will need to do everything that is necessary to accomplish the outcomes that they are trying to accomplish within the sphere of your mission. If you are Lead to Money, then you look at what a complete lead to money ecosystem looks like. You decide what you can directly provide, what you can and want to build and what you need to fill it out from partners. You then find the partners to fill it out. The relationships you develop are go-to-market and strategic because that’s what you will be doing – presenting a well-crafted ecosystem to the prospective customer base – with a narrative that shows how the ecosystem addresses their needs. That will change the partnership structure somewhat but it will be well worth it. 2. Develop an influencer program – They are on the cusp when it comes to outreach. Chris Bucholtz has done a masterful job — along with Giles House — in their initial forays into the analyst universe beyond the institutional analysts of the Gartner and Forrester stripe. They are engaging them to speak and to produce thought leadership. But they have the size and they are at the point that a formal influencer program needs to be put into place. They have done a great overall Step 1 job. Expand from the institutional analysts to the independents (they haven’t done much with the boutique firms yet). But now they need to start looking at the influencer community beyond the analysts – journalists, evangelists for a concept or technology. For example, Lauren Vargas, who runs and develops strategy for all the community and social channels (among other things) for Aetna is exactly this kind of person. A practitioner who’s influence goes beyond her immediate circle and job. Rich Toohey, VP of Global Loyalty for Marriott is another example. Beyond that expansion, they need to institute a regular briefing schedule for the analysts to stay up on latest product releases and developments with company. In other words, they need to develop, world’s worst word warning coming up….cadence with the influencers. A very important next step for Callidus Cloud. Callidus Cloud began their live as an incentive compensation management technology company. They’ve made a huge leap to a much broader market and, unlike most companies, have successfully navigated the transition and kept their narrative continuous. That’s hard to do. But, doing that gives Callidus Cloud an impact in the market that I just see continuing for the next several years. That’s why they are here. For many years I’ve watched technology companies try to help customers by providing business analysts to the customer to figure out what it is, given their existing processes and practices, has to be done in order to implement the vendor’s software in an optimal way to help the customer make it work to their benefit. This is fine. It is part of what is now a growing categorical concern – customer success. What it doesn’t do is modify or fix any of the processes and practices if they are clearly broken or impractical or even outright destructive to the customer’s business. The job of this business analyst is to make the vendor’s technology work with what is there. But, I’ve always been somewhat diffident about that. I understand the value because when it comes down to it, the software vendor does what you would expect them to do – sell software, not provide strategic services. Typically when the services border on strategic, its implementation strategies that we are talking about. I remember being at one large vendor’s headquarters many years ago and I was speaking to exactly this kind of business analyst. He was very frustrated because he saw problems with processes and practices all the time that could be fixed and all he was able to do was to optimize the software to the bad processes which as often as not, magnified the problems. Ahhh. True services. An unleashed business analyst becomes a consultant. That is one of their unique value propositions. They can provide critical services and fix and alter customer’s thinking and actions. AND they are willing to do that. Their services don’t stop with these advisory efforts though. They have PR functions (as did Vocus) so that they can help their customers generate news coverage for content with a database and engine that can handle 30,000 bloggers and journalists. That distinction alone makes them a contender for the Watchlist but it isn’t enough of a reason for them to win the Watchlist by itself. This company is as interesting as the parent who spun it off.Vocus made honorable mention last year. What makes OutMarket interesting is that even though they consider themselves a marketing automation company, they keep the clear distinctions that got Vocus to the honorable mention – the services component – though in the case of Vocus, it was Public Relations services. Vocus operated like a mini-agency in addition to providing applications. OutMarket, despite its Vocus pedigree, chose to actually expand its footprint and enter bigger markets. They took the Vocus hybrid marketing/PR product and added automated workflows, lead scoring and integration with Salesforce. They also enhanced the outreach tools by providing what they call “proprietary” social media tools, Buying Signals, finds and quantifies social media leads for marketers and theirRecommendation Engine which is an advisory engine that recommends what content to share with which prospects and clients. I’m not sure why they call that proprietary. Maybe their rendition of it is? The recommendation engine for example is similar to one that Captora has – or at least does the same thing. Also a number of the marketing automation vendors – Oracle Eloqua integrate “social data” into their lead scoring regardless of which channel the lead comes from – or can do that I mean. I wouldn’t call this proprietary. However, this is part of their suite and adds to a fresh distinct marketing automation technology suite. The other thing they have going for them is a clear view of the market they want to attack. They are midmarket and don’t aspire to anything else. What makes that great is that they can build out their applications to a specific market that has distinct characteristics that are unlike another market’s. They don’t have to dumb down or gin up a different level of application suite. That is both great for this unique approach to marketing and is a real indicator that this management group has explicit ideas of what it wants to do with the company. They also are priced according to their market. All in all, a good coherent highly focused company worldview. They are a practical company with very sharply defined approaches and strategies. For example, in order to build up the number of qualified sales leads and prospects, they had to build educational content that explained marketing automation to marketers. But they also understood that not only were the marketers potentially all at different levels of knowledge but as they succeeded the level of knowledge of the marketers they were interacting with would change too, if they were doing their job. So they defined all their campaigns around driving expert content in a highly personalized manner. As they so rightfully put it, “Engagement and personalization is key with all these interactions.” That means that each of the individual marketers are typed or personified by individual characteristics and industry. That results in a personalized communications stream. But doing that also sussed out midmarket verticals that could be focused on – nonprofit, healthcare (a hot, hot, hot one) and ecommerce. What you see here is a methodical, very smart company with a clearcut focus and strategy. But, like all companies, that doesn’t mean there isn’t room for improvement. In the case of OutMarket it’s highly specific. Their own strategic clarity points out where the murkiness lays. 1. Be more visionary, less self-centered – They don’t really have much of a vision. Here it is….wait…I can’t find out. I found a mission. “Our mission is to enable modern marketers to succeed in a new world.” That’s a legitimate mission. But they lack anything visionary. I’ve harped on this a great deal in the post about Salesforce and EY Advisory – two companies that get the idea of a true vision – one that not only states a future that is in line with transformation of something but also gets the person hearing about it to buy in. EY Advisory – “Building a better working world.” Salesforce – The connected customer. Vision is almost NEVER around the products you sell to customers, it’s’ about the world that you want to help change. 2. Make the messaging more consistent with their actual strategy and practices – Their messaging reflects their weak vision. “Your marketing works better when it’s integrated and automated.” For a company that has a unique product set and a very focused and interesting value proposition, this is totally bland and says nothing that someone doesn’t know, nor is it positioning OutMarket to do something that every single one of their competitions minus a very few laggards doesn’t do. The reason for this is reflected in another statement in marketing strategy section – “The focus of our mission and vision is to be the leading provider of marketing automation software that is easy to use….” That is NOT a vision that people buy into. It is however consistent with the primary marketing message above. Which not only does nothing to distinguish OutMarket from the rest of the marketing automation and in fact software universe, but makes this amazingly interesting company….uninteresting. This needs to be changed, pronto. Now. Immediately. 3. Strong Influencers, decent institutional analysts, weak independent analysts – OutMarket has arguably the most comprehensive influencer program I’ve ever seen – and that part of their outreach is genuinely brilliant and entirely aligned with a market that influencers impact every day. They spend the time with people who aren’t analysts who impact brands, other people, markets etc in whatever position they are in. So names like the incredible Leslie Bradshaw, or David Armano, or Vala Afshar, Avinash Kaushik and the amazing Lauren Vargas are in touch with them. They have a solid group of institutional and a few boutique analysts who they speak with. But they fall down rather badly when it comes to independents. They even include me on the list and lay claim to extensive work and bringing analysts on board for thought leadership. If the interactions I have with them is any indicator, this is an overstatement by quite a bit. What that means is that they have to do two things when it comes to the independent analysts and given the rest of their program, it shouldn’t be all that hard, unless they are understaffed. First, extend their reach with the independents – start talking to the ones that are obvious out there. There are 10-15 I could identify in a heartbeat. Second, either scale back their claims of working so intensely or start doing what they are claiming they do with the independents. Get a clear cut program for the different groups in place and execute. Claims are one thing, execution is another. The irony is that this is a company that is thoughtful and executes very, very well. This is just a bit of a glitch and an ironic one given their PR history.